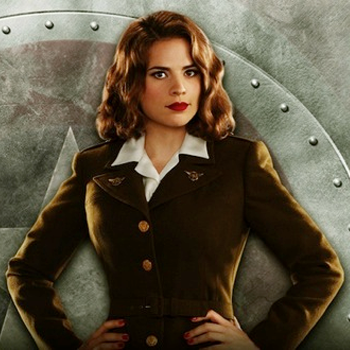 When Agents of S.H.I.E.L.D takes its mid-season break this coming season, the gap in new episodes will be filled by Agent Carter, a miniseries set in the late-1940s based around Haley Atwell's Agent Peggy Carter character from Captain America: The First Avenger. Now, at Marvel's SDCC Television panel, Marvel's TV head Jeph Loeb has announced that Joe & Anthony Russo - who directed Captain America: The Winter Soldier - will direct the second and third episodes of the series, with First Avenger's Joe Johnston in talks for the fourth. Episode one will be handled by Louis D'esposito, a longtime Marvel hand who directed the original Agent Carter "One-Shot" that the series is based on. The Russos cut their teeth as directors on television series like Community before breaking into features. Johnston is an old Hollywood pro, otherwise best known for directing The Rocketeer and the most recent Wolf Man feature.